It is a lofty and noble goal: eliminating racism and anti-Semitism in the world. Cathleen Giustino, the Mills Carter Professor of History in Auburn University’s College of Liberal Arts and recipient of the university’s Creative Research and Scholarship Award, is doing her part one museum collection at a time. Giustino’s work is concerned with material objects displayed in museums, primarily in Czechoslovakia during the Cold War and now in the Czech Republic, and what those objects say about the workings of racism and anti-Semitism in the past and the present. “My research has allowed me to pursue my love of foreign languages, see amazing architecture and art, meet leading experts in my field, carry out archival research, participate in international exchanges of ideas and make some good friends,” she said. Her attention to material culture stems from her larger interest in expanding the types of evidence historians use when seeking to understand change over time. Traditionally, she says, historians work with written sources. She wants to understand the role of material objects in the history of politics, culture and society and to see what new knowledge can be gained about the past through the study of things. To put a face to the stories of people and things that she’s uncovering, Giustino has followed the lives of two particular individuals during the time between 1938 and 1958 when literally millions of possessions were confiscated from private owners in Central Europe. One of the people—a dispossessor, she calls him—was someone who would go into confiscated homes and “secure” valuable items in the name of the state. “I’m using his story to draw out the wider institutional history of the confiscations,” she said. The second person she’s studying tells the other side of the story. “I’m also looking at the experiences of a woman who was confiscated from, who had her things taken—two times!” she said. A long-time collector of valuable interior decorations, the woman was married to a wealthy Bohemian-German industrialist. The woman survived the Holocaust, and after the war, she wanted her possessions back. Instead, though, they were confiscated from her a second time, this time by the restored Czechoslovak state “on the grounds that she was German and all Germans were categorized as enemies of the people and ‘unreliables’ who would be expelled from the country and have their property seized,” Giustino explained. The women did eventually have her art and antiques restituted to her. But millions of other objects confiscated from persecuted people remained the property of the state. Many of the culturally valuable objects were put on display in museums in socialist Czechoslovakia and are still on display today in the Czech Republic. “I am interested in how things that have been seized from persecuted people can contribute to the perpetuation of racism and anti-Semitism, and I’m hoping that by bringing to light the histories of these things and the histories of the people who owned or took these things, we can grow more aware of ways in which we unknowingly perpetuate discrimination,” she said. She said one of the big goals of her project is to understand ways in which museum exhibitions can be unwitting agents in the dissemination of intolerance and the transmission of hatred across generations. Giustino says that she sometimes feels that it sounds naïve to say she wants to end racism and anti-Semitism, especially given current events in many parts of the worlds. “Still, a much stronger part of me knows that I must contribute to efforts to stop the now long histories of hatred and dislike of people due to differences in religion, skin-color and nationality,” she said. Her research is very important for this goal and so is her teaching. “In my teaching, I try to deepen students’ understanding of the institutions that promote and reproduce racism and anti-Semitism. Some of these institutions are very obvious including, for example, government laws that discriminate against people based on their religion or skin color. Others are subtle and less overt, and this relates to my current research project,” she said. Working with her students, she says, is one of the most rewarding parts of her work, because she gets to share her love of history with them while watching them grow over the course of a semester. When she’s not teaching or traveling to conduct research, Giustino is focused on another big passion—spending time with man’s best friend. “Since 2010, my husband and I have been very involved in the rescuing and fostering of homeless dogs,” she said. “We have focused on dogs with special medical needs, including senior dogs who need hospice care.” Through this work, she has connected with other rescuers in the Auburn-Opelika area, some of whom are fellow faculty members. 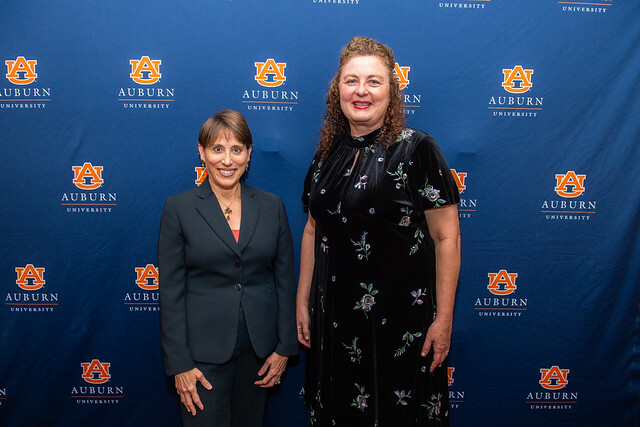 Auburn University's Interim Vice President for Research Jennifer Kerpelman, left, presents Cathleen Giustino with the Creative Research and Scholarship Award during a Nov. 13 ceremony. 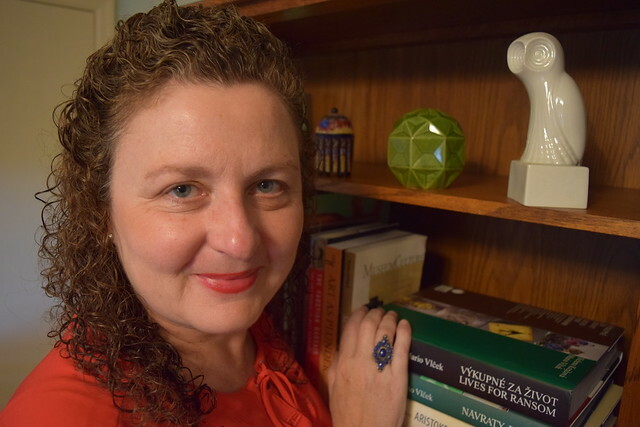 Cathleen Giustino, , the Mills Carter Professor of History in Auburn University’s College of Liberal Arts, was the recipient of the Creative Research and Scholarship Award.